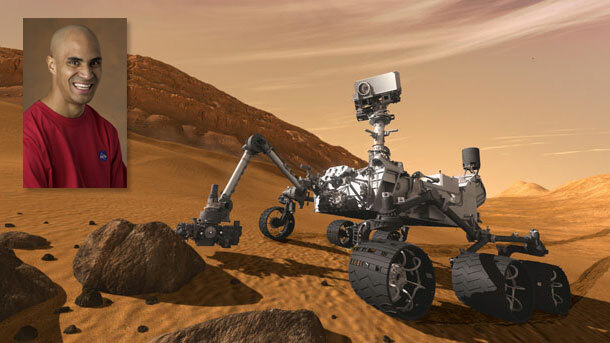 October 23, 2015 – Lone Tree Arts Center will present National Geographic Live: Exploring the Red Planet, with NASA engineer Kobie Boykins, on Sunday, October 25, at 7:30 p.m. A separate student matinee is available on Monday, October 26, at 10:00 a.m.
NASA’s Mars Exploration Program has had a huge impact on Colorado and has captured the world’s imagination. Companies like Lockheed Martin, Ball Aerospace & Technologies, Southwest Research Institute, and the Laboratory for Atmospheric and Space Physics are paving the way for NASA’s Journey to Mars. As an engineer at NASA‘s Jet Propulsion Laboratory (JPL), Kobie Boykins is also on the front line of Mars exploration. Boykins began his career in the Advanced Mechanical Systems group at JPL while he was still a student studying mechanical engineering at Rensselaer Polytechnic Institute in Troy, New York. After graduation, he first worked on the entry, descent and landing systems for the Mars Pathfinder mission. Boykins has since worked on the Sojourner, Spirit, Opportunity and Curiosity rovers. In 2013, Boykins was awarded a NASA Exceptional Service Medal, one of the highest honors given to NASA employees and contractors. Boykins brings his passion for space exploration to audiences worldwide as he recounts the challenges and triumphs of the rover missions. As part of the National Geographic Live speaker series, he shares remarkable images and information about the latest chapter in the ongoing story of Mars exploration. Tickets for this weekend’s presentations at Lone Tree Arts Center are available online or at the box office.